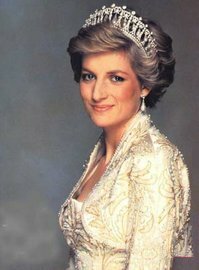 Diana, Princess of Wales (Diana Frances Mountbatten-Windsor, née Spencer) (1 July 1961–31 August 1997) was the first wife of HRH The Prince Charles, Prince of Wales. From the time of her engagement to the Prince of Wales in 1981 until her death in a car accident in 1997, Diana was arguably the most famous woman in the world, the pre-eminent female celebrity of her generation: a fashion icon, an ideal of feminine beauty, admired and emulated for her high-profile involvement in AIDS issues and the international campaign against landmines. During her lifetime, she was often referred to as the most photographed person in the world. To her admirers, Diana, Princess of Wales was a role model — after her death, there were even calls for her to be nominated for sainthood — while her detractors saw her life as a cautionary tale of how an obsession with publicity can ultimately destroy an individual. The Honourable Diana Frances Spencer was born as the youngest daughter of Edward Spencer, Viscount Althorp, and his first wife, Frances Spencer, Viscountess Althorp (formerly the Honourable Frances Burke Roche). Partially American in ancestry — a great-grandmother was the American heiress Frances Work — she was also a descendant of King Charles I. During her parents' acrimonious divorce over Lady Althorp's adultery with wallpaper heir Peter Shand Kydd, Diana's mother sued for custody of her children, but Lord Althorp's rank, aided by Lady Althorp's mother's testimony against her daughter during the trial, meant custody of Diana and her brother was awarded to their father. On the death of her paternal grandfather, Albert Spencer, 7th Earl Spencer, in 1975, Diana's father became the 8th Earl Spencer, and she acquired the courtesy title of The Lady Diana Spencer. A year later, Lord Spencer married Raine, Countess of Dartmouth, the only daughter of the romance novelist Barbara Cartland, after being named as the "other party" in the Earl and Countess of Dartmouth's divorce. Dodi Fayed and Henri Paul were both declared dead at the scene of the crash. Trevor Rees-Jones was severely injured, but later recovered. Diana was freed, alive, from the wreckage, and after some delay due to attempts to stabilize her at the scene, she was taken by ambulance to Pitié-Salpêtrière Hospital, arriving there shortly after 2.00 a.m. . Despite attempts to save her, her internal injuries were too extensive. Two hours later, at 4.00 that morning, the doctors pronounced her dead. At 5.30, her death was announced at a press conference held by a hospital doctor, Jean-Pierre Chevènement (France's Interior Minister) and Sir Michael Jay (Britain's ambassador to France). Later that morning, Chevenement, the French Prime Minister, Lionel Jospin, the wife of the French President, Jacques Chirac, and the French Health Minister, Bernard Kouchner, visited the hospital room where Diana's body lay and paid their last respects. After their visits, the Anglican Archdeacon of France, Father Martin Draper, said commendatory prayers from the Book of Common Prayer. Initial media reports stated Diana's car had collided with the pillar at over 190 km/h (120 mph), and that the speedometer's needle had jammed at that position. It was later announced the car's actual speed on collision was about 95-110 km/h (60-70 mph), and that the speedometer had no needle as it was digital. The car was certainly travelling much faster than the legal speed limit of 50 km/h (30 mph), and faster than was prudent for the Alma underpass. In 1999 a French investigation concluded the Mercedes had come into contact with another vehicle (a white Fiat Uno) in the tunnel. The driver of that vehicle has never come forward, and the vehicle itself has not been found. The investigators concluded that the crash was an accident brought on by an intoxicated driver attempting to elude pursuing paparazzi at high speed. On 6 January 2004, an inquest into the death of Diana opened in London held by Michael Burgess, the coroner of The Queen's Household. Although the official investigation found Diana had died as a result of an accident, there are a significant number of conspiracy theories that she was assassinated. The French investigators' conclusion that Henri Paul was drunk was made largely on the basis of an analysis of blood samples, which were stated to contain an alcohol level that (according to Jay's September 1997 report) was three times the legal limit. This initial analysis was challenged by a British pathologist hired by the Fayeds; in response, French authorities carried out a third test, this time using the medically more conclusive fluid from the sclera (white of the eye), which confirmed the level of alcohol measured by blood and also showed Paul had been taking antidepressants. The samples were also said to contain a level of carbon monoxide sufficiently high as to have prevented him from driving a car (or even from standing). Some maintain this strongly indicates the samples were tampered with. No official DNA test has been carried out on the samples, and Henri Paul's family has not been allowed to commission independent tests on them. The families of Dodi Fayed and Henri Paul have not accepted the French investigators' findings. In the Scottish courts, Mohamed Al-Fayed applied for an order directing there be a public inquiry and is to appeal against the denial of his application. Fayed, for his part, stands by his belief that the Princess and his son were killed in an elaborate conspiracy launched by the SIS (MI6) on the orders of the "racist" Prince Philip, Duke of Edinburgh. This was apparently based on the grounds that the Duke abhorred the idea of his grandsons potentially having Muslim or half-Arab siblings. Other motivations which have been advanced for murder include suggestions Diana intended to convert to Islam, and that she was pregnant with Dodi's child. In January 2004, the former coroner of The Queen's Household, Dr. John Burton, said (in an interview with The Times) that he attended a post-mortem examination of the Princess's body at Fulham mortuary, where he personally examined her womb and found her not to be pregnant. Later in 2004, US TV network CBS showed pictures of the crash scene showing an intact rear side and an intact centre section of the Mercedes, including one of a unbloodied Diana with no outward injuries, crouched on the rear floor of the vehicle with her back to the right passenger seat — the right rear car door is completely opened. The release of these pictures caused uproar in the UK, where it was widely felt that the privacy of the Princess was being infringed, and spurred another lawsuit by Mohammed Al-Fayed. Rumours and conspiracies theories aside, it is clear that Diana, Dodi and Paul were not wearing seat belts when the car crashed. Rees-Jones, the only survivor, had his seat belt on. Also, the underpass at the Place de l'Alma is known as an accident black spot; it is on a stretch of high-speed road but only has limited visibility ahead in places; and there are square-shaped pillars in the central reservation which could lead to collisions. Diana's death was greeted with extraordinary public grief, and her funeral at Westminster Abbey on 6 September drew an estimated 3 million mourners in London, as well as worldwide television coverage. People in India watched the funeral, even as mourning started to sweep over their country following the passing of Mother Teresa the day before. More than one million bouquets were left at her London home, Kensington Palace, while at her family's estate of Althorp the public was asked to stop bringing flowers, as the volume of people and flowers in the surrounding roads was causing a threat to public safety. The reaction of the Royal Family to the death of Diana caused unprecedented resentment and outcry. The Royal Family's rigid adherence to protocol was intepreted by the public as a lack of compassion: the refusal of Buckingham Palace to fly the Union Flag at half mast provoked angry headlines in newspapers. "Where is our Queen? Where is our Flag?" asked The Sun. The Queen, who returned to London from Balmoral, agreed to a television broadcast to the nation. At the urging of Downing Street, what was to be a recorded piece became a live broadcast, and the script was revised by Alastair Campbell to be more "human". Mourners cast flowers at the funeral procession for almost the entire length of its journey. Outside Westminster Abbey crowds cheered the dozens of celebrities who filed inside, including singer Sir Elton John (who performed a re-written version of his song Candle in the Wind). The service was televised live throughout the world, and loudspeakers were placed outside so the crowds could hear the proceedings. Tradition was defied when the guests applauded the speech by Diana's brother, Lord Spencer, who bitterly attacked the press and indirectly criticised the Royal Family for their treatment of her, although Lord Spencer himself had years earlier refused Diana permission to use a cottage at Althorp as a sanctuary due to his fears about press intrusion into his family home. Diana, Princess of Wales is buried at Althorp in Northamptonshire on an island in the middle of a lake called the Round Oval. A visitors' centre allows visitors to see an exhibition about her and walk around the lake. During the four weeks following her funeral, the overall suicide rate in England and Wales rose by 17%, compared with the average reported for that period in the four previous years. Researchers suggest that this was caused by the "identification" effect, as the greatest increase in suicides was by people most similar to Diana: women aged 25 to 44, whose suicide rate increased by over 45%. In the years after her death, interest in the life of Diana has remained high, especially in the United States of America. Numerous manufacturers of collectibles continue to produce Diana merchandise. Some even suggested making Diana a saint, stirring much controversy. As a temporary memorial, the public co-opted the Flamme de Liberté (Flame of Liberty), a monument near the Alma Tunnel, and related to the French donation of the Statue of Liberty to the United States. The messages of condolence have since been removed, and its use as a Diana memorial has discontinued, though visitors visit and still leave messages at the site in her memory. The concrete wall at the edge of the tunnel is still used as an impromptu memorial for people to write their thoughts and feelings about Diana. A permanent memorial, the Diana, Princess of Wales Memorial Fountain was opened in Hyde Park in London on 6 July 2004, but it has been plagued with problems and has been declared off-limits to the public at least twice for repairs. In 1999, a little more than a year after her death, the journalist Christopher Hitchens made a vulgar, derogatory and controversial comment about her while on a cruise ship. He stated that Diana "has in common with a minefield the following: relatively easy to lay but extremely difficult, expensive, and dangerous to get rid of." When there was a backlash concerning his quip he said he thought, "it was funny." Diana was ranked third in the (2002) Great Britons poll sponsored by the BBC and voted for by the British public. In 2003, Marvel Comics announced it was to publish a five-part series entitled Di Another Day (a reference to the James Bond film Die Another Day) featuring a resurrected Diana, Princess of Wales as a mutant with superpowers, as part of Peter Milligan's X-Statix title. Amidst considerable (and predictable) outcry, the idea was quickly dropped. Heliograph Incorporated produced a roleplaying game, Diana: Warrior Princess by Marcus L. Rowland about a fictionalised version of the twentieth century as it might be seen a thousand years from now. After her death, the actor Kevin Costner, who had been introduced to the Princess by her former sister-in-law, Sarah, Duchess of York claimed he had been in negotiations with the divorced Princess to co-star in a sequel to the thriller film The Bodyguard, which starred Costner and Whitney Houston. Buckingham Palace dismissed Costner's claims as unfounded.